In translating Michael Crichton’s dark novel to the screen, one of the bigger changes that Steven Spielberg and David Koepp made to Jurassic Park was the softening of InGen CEO John Hammond. In the novel, Hammond is a cold, aloof CEO, more of an eccentric with a profit motive than a dreamer. Under the vision of the filmmakers, who casted Richard Attenborough, Hammond becomes a sympathetic, if slightly misguided Walt Disney figure. Jovial and paternal, Hammond seems to only want to use science to create a sense of childlike wonder in all of the guests of Jurassic Park (it makes perfect sense that Attenborough’s next role was Kris Kringle in the Miracle on 34th Steet remake). He even goes so far as to rebuke Donald Gennaro, the InGen investors’ lawyer, about the potential profit by leaving Jurassic Park as an experience for the superrich. 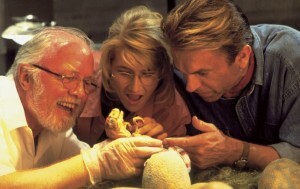 So while Hammond is a benevolent figure, is the disaster at Jurassic Park still his fault? The film does tease that there is more to Hammond than being a grandfather and future theme park icon. He isn’t a pushover, and it is easy to see that working for Hammond would have its challenges. While he truly believes in the work that goes into creating the park, he has an antagonistic relationship with game warden Robert Muldoon (Bob Peck) and systems coder Dennis Nedry (Wayne Knight). Muldoon’s main source of ire is the continued existence of the velociraptors. “They should all be destroyed,” Bob Peck growls as he delivers Muldoon’s pithy opinion on the subject. And the film does give a sense that InGen isn’t entirely sure what to do with them. Despite its (absurdly) close proximity to the main compound of the park, the raptor enclosure is densely landscaped; the dinosaurs inside aren’t easily visible to guests. They are not on the tour, isolated from everything else. So why are they there? Hammond’s relationship with Nedry gets even more interesting. As Hammond shows Alan Grant (Sam Neill), Ellie Satler (Laura Dern), and Ian Malcolm (Jeff Goldblum) around Jurassic Park, he intones that InGen “spared no expense” a total of four times, including the state of the art electric cars and tour narration provided by Richard Kiley. 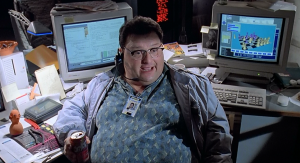 However, while the technical aspects of Jurassic Park can be run by a handful of people in one control room, there is one place where Hammond decided to lowball: Dennis Nedry. 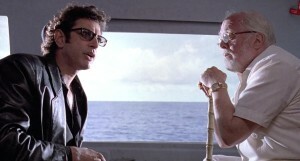 John Hammond: I’m sorry about your financial problems, Dennis, I really am, but they are your problems. Dennis Nedry: Oh, you’re right, John, you’re absolutely right. You know, everything’s my problem. Dennis Nedry: There’d be hardly any debate at all. John Hammond: I don’t blame people for their mistakes. But I do ask that they pay for them. InGen clearly went with one of the lowest bidders for this job, and while the park does seem state of the art, Nedry build into the system all kinds of overrides, backdoors, and other “hacker crap.” Of course, from early on in the film, we know that Nedry has agreed to be a corporate spy for one of Hammond’s rivals. And while the film never elaborates on what Nedry’s financial problems are, they are enough to motivate his nefarious acts. The film isn’t telling us that Hammond should have paid Nedry more in order to prevent this attempted espionage. The message here is about where dreams meet reality. For Spielberg, it’s in filmmaking, like altering a script to accommodate the non-functioning lifesize mechanical shark. For Walt Disney, it was his quixotic notions for EPCOT. And for John Hammond, even with all the lysene contingencies and electric fences in the world, hubris still takes its toll. Control of nature is an illusion at best. Nedry is an antagonist, but doesn’t represent rationality or reality. He’s the element of chaos, driven by greed and maybe desperation. 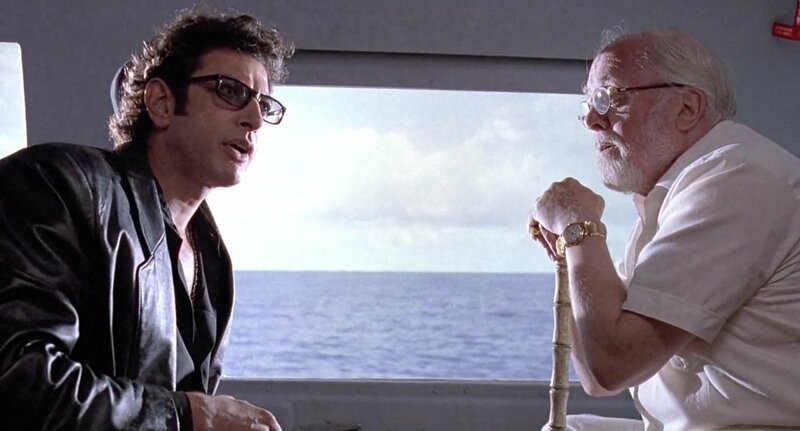 The character that most closely acts as Hammond’s foil is Ian Malcolm. Just look at the image above! Spielberg has them on either side of the frame, Goldblum in black and Attenborough in white, yin and yang. For Malcolm, chaos theory doesn’t just describe a random element, but is blended with the propensity of nature to push forward. It would be simplistic to characterize Malcolm as anti-science, even considering how he chastises the scientific endeavor of dinosaur cloning. It’s the blind push forward without considering the potential consequences he is pushing back against. Also of note is that Malcolm wasn’t brought to Jurassic Park by Hammond. Rather, he was selected by Gennaro and the investors. While Hammond characterizes the chaostician as a “rock star,” Malcolm represents the limits to the dream, both of control and of finances. He is the producer who finds ways to cut the director’s budget. But just because he ends up being right doesn’t mean it isn’t worthwhile to try and bring the dream to life. Jurassic Park ends on a triumphant note, after all. In the book, Hammond dies an ignoble death and they burn the entire island with napalm. The dream is dead, scorched from the earth. Spielberg has a different message. Watching birds, the modern day descendents of dinosaurs, soar along with the helicopter allows the film to exit on a hopeful note. Dinosaurs are out there, if you know where to look.